When you think of the fast-paced twitchy shooter DOOM, did you ever consider that it’s an experience that should be available on a portable device? Regardless of your thoughts, it’s happening. Bethesda and id Software have decided to bring 2016’s DOOM to the Nintendo Switch, complete in its unabashed violence and quick pacing. I had a chance to give it a go last week, and I’m pretty surprised by what I saw. Rip and wahoo! Upon booting the game up on the Switch (un-docked), it was a tad disconcerting to see the familiar main menu and intro scene on such a small display. UI elements probably need to be enlarged; unless you like hunching over your switch, you’ll have a hard time seeing a few things like the main menu text. 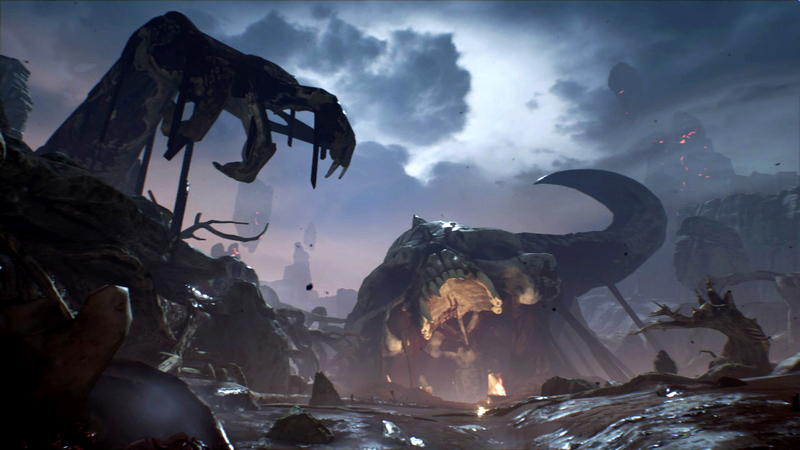 Once in-game scenery appeared, though, it was clear that DOOM even in un-docked mode didn’t suffer all too much in its transition to Nintendo’s portable powerhouse. id Software somehow retained a lot of the game’s visual effects, but at the cost of resolution. The game looks as if it was set to decent graphical settings, but was just output at a resolution that makes it a tad blurrier than you may comfortable with. The game played at around 30 FPS as well. Overall, it’s satisfactory for any fan that wants access to DOOM on the go or has yet to play it before and have no other option than their Switch. Personally, I did experience some slight discomfort looking at the screen for too long, but I’m going to attribute this mostly to trying to focus too hard on small visual elements on the sun-lit Switch screen. The screen suffered from considerable sun glare at the venue for the preview event. Unfortunately, I was unable to test docked mode which should offer an even better experience. It’s unclear if this will boost FPS at all. DOOM is a game best enjoyed with a mouse. There’s no escaping that. Even on PC, if a controller is your preferred playstyle like it’s often mine, there’s no getting around that DOOM is a shooter designed and best played with a mouse (and keyboard) setup; the difference is transformative. One can play with a controller, but it’s really not the same. On a console, though, that choice isn’t available. 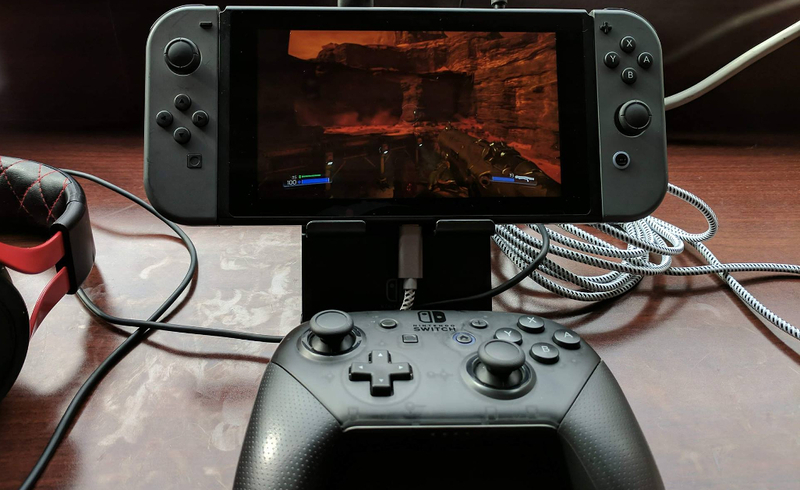 DOOM on the Switch offers multiple control options for those of you cool with buying multiple Nintendo accessories. At the event, the reps recommended we play with the Switch Pro controller. For a good reason too; the Pro controller plays pretty well and just as good on other platforms. But things got tricky when I switched to the Joycon controllers. As a twitchy shooter, responsiveness is key. The Switch Joycon analog sticks have too high of a threshold for input to be as precise as they need to be for this game. Against recommendations, I tried playing for half of my preview using the Joycons, and it was passable at best. There may be a saving grace here, though. The Switch version of DOOM could potentially have motion aiming support, but it wasn’t accessible in the preview build — although the option was visible in the settings menu. Not making this control style a priority is a major missed opportunity in my opinion. If motion control is added and is akin to the functionality found in Splatoon 2 for the right Joycon to aim, then things could change dramatically for the Switch DOOM port. Assuming motion support is implemented (and well), DOOM on the Nintendo Switch could elevate itself to be the best version of the game available on consoles. It’ll absolutely be less visually-appealing, but the responsiveness and speed of aiming with motion aiming controls could surpass any analog stick and get close to mouse-levels of precision. This right here would be the major selling point; it’s just a shame the functionality wasn’t available at the time of testing. All other things considered, the overall experience of DOOM on the Switch ain’t half bad.